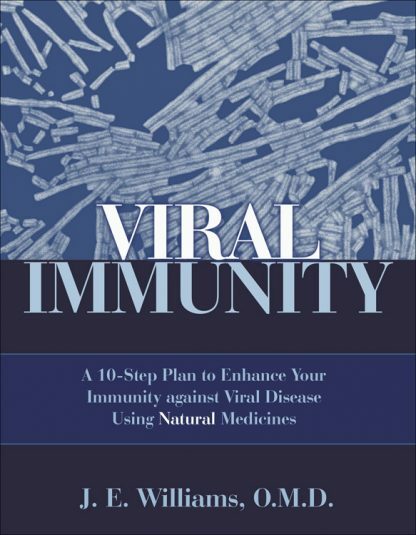 Red Wheel ∕ Weiser Online Bookstore | Viral Immunity: A 10-Step Plan to Enhance Your Immunity against Viral Disease Using Natural Medicines by J.E. Williams, O.M.D. HIV, hepatitis, influenza, the common cold, herpes, Ebola, Hantavirus, West Nile fever, dengue, TT virus--the viral world keeps posing new major challenges to human health each year. At the same time as this onslaught of emerging powerful viral infections, our antibiotic arsenals are losing ground and our immune systems are compromised. Can we handle the next viral epidemic? Yes, says James Williams, an experienced, credentialled naturopath, acupuncturist, and expert in traditional Chinese medicine. We can shore up our immune system to handle current and any future viral infections and not be dependent on conventional vaccinations or antibiotics to insure our health. In 10 practical steps, Dr. Williams shows how to develop unassailable viral immunity using natural approaches. If you already have a viral infection, these steps will help you reverse its effects; if you're concerned about exposure to one in the future, these steps will give you the keys to prevention. Included in these steps are the best that natural medicine offers: stress management, enzymes, nutrients, detoxification, oxygen therapy, immune modulators, hormones, natural antiviral medicines and anti-inflammatory medicines, Chinese and Western herbs, and more. "Viral immunity is without question one of the most important health issues of this century," says Dr. Williams. "The message of this book is clear. You can improve your system in general with diet, lifestyle, and natural medicines. Here you will find natural ways of improving immune function, remedies to treat viral infections, and suggestions on how to reframe outdated concepts that could otherwise prevent you from obtaining effective treatment."